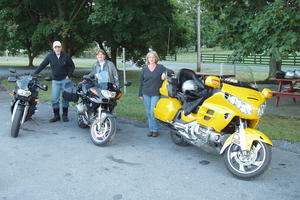 See what others are saying about Motorcycle Travel Network. We hosted Steve and Bev from Ocala, FL. for two nights as they wanted to experience north-central Texas riding. They were great guests and I hope we were good hosts. They are on a prolonged travel around the USA...so you might expect an email or phone call from them anywhere in the lower 48! Looking forward to visiting our MTN friends on a trip to Wing Ding 36. Just had our first visitors from PA, Cindy and John. Had a great time talking about motorcycling and future trips! We are gonna love this!!! I think I didn't finish my last Feedback - sorry! We are using the MTN Network almost exclusively ever since we joined, and have met wonderful people who have become friends. The next couple weeks promises to bring even more friends into our lives! Thanks for a great website! think I didn't finish my last Feedback - sorry! We are using the MTN Network almost exclusively ever since we joined, and have met wonderful people who have become friends. The next couple weeks promises to bring even more friends into our lives! Thanks for a great website!